The recently-released workout machine was designed with the input of area residents. VANCOUVER — Treadmills and ellipticals had better watch their back; there’s a new player on the home-gym court. Bowflex’s recently released LateralX workout machine puts a new twist on a classic design, combining the traditional bi-directional movement of an elliptical with an additional left-right gyrating action to provide three dimensions of intensive workout motion. The Bowflex LateralX, released in July, was 100 percent developed in Vancouver by Nautilus Inc. with the help and feedback of Clark County-based focus groups. Photo courtesy of Michael McCormic Jr.
Nearly everyone is familiar with the Bowflex commercials that regularly appear on television, yet many Clark County residents are surprised to learn that the products they see in these advertisements are developed in their own backyard. Nautilus, Inc., based in Vancouver, is the parent company of six exercise equipment brands, including Bowflex. In fact, not only was the machine invented and designed here, but many area residents have unwittingly had a hand in the perfection of the LateralX’s design. 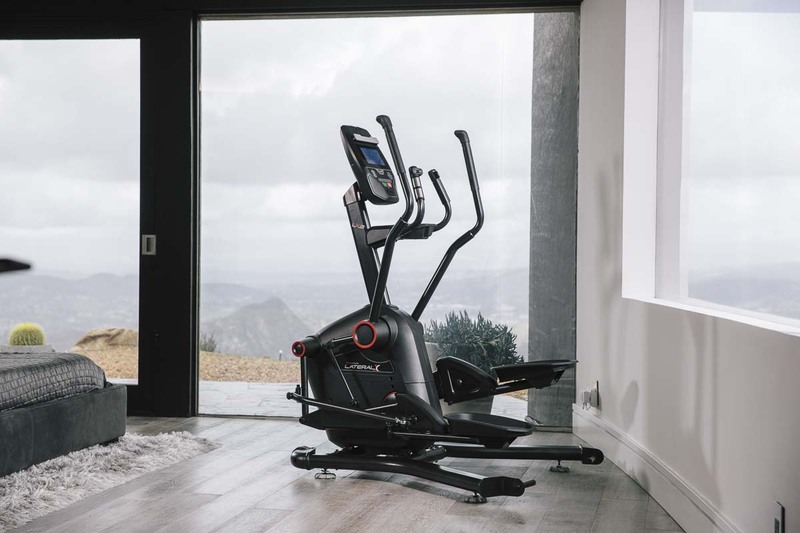 Combining the bi-directional action of an elliptical with a left-right foot pedal movement, the LateralX gives a three-dimensional motion experience that is unlike any other home-gym product. Photo courtesy of Michael McCormic Jr.
Nautilus’s research and development lab, located at their Vancouver office in the Columbia Tech Center, is where the magic begins. Scott Eastman manages the reliability test lab at Nautilus, where each new product is born out of the customer feedback from previously released exercise equipment. As Eastman explains, every Nautilus product begins with an idea, which is then developed into a prototype at the Vancouver Nautilus Innovation Center, where boring machines, plasma cutters, 3D printers, a weld shop, and a complete paint booth keep all of the work contained to the same location. Once a prototype has been constructed, a focus group is invited to test the product and offer input to refine its function and usability. Once the necessary adjustments have been made, the product design is sent to the manufacturer and sold through a combined effort of commercials, call centers, and retail stores. The LateralX was no easy task for the development team; Eastman describes it as “the most complex product we’ve ever done.” Even with the difficulty of creating a product with three-dimensions of elliptical motion, the LateralX was not the only thing on Eastman’s plate. At any given time, there are between 5 to 10 products in development at the lab. This is because Nautilus is constantly testing the durability and longevity of each recently released product using custom-built machines to simulate the types of use the equipment will endure. While this may not seem like much given the relatively small scope of Bowflex strength training equipment, Nautilus oversees testing for much more than just the Bowflex brand. The flagship brand of the company remains the Bowflex line, which began in the 1980s with rod-style home gym systems. The emphasis for this brand remains grounded in achieving high-performance and results in the home setting. Octane Fitness is Nautilus’s self-described commercial line of exercise equipment. 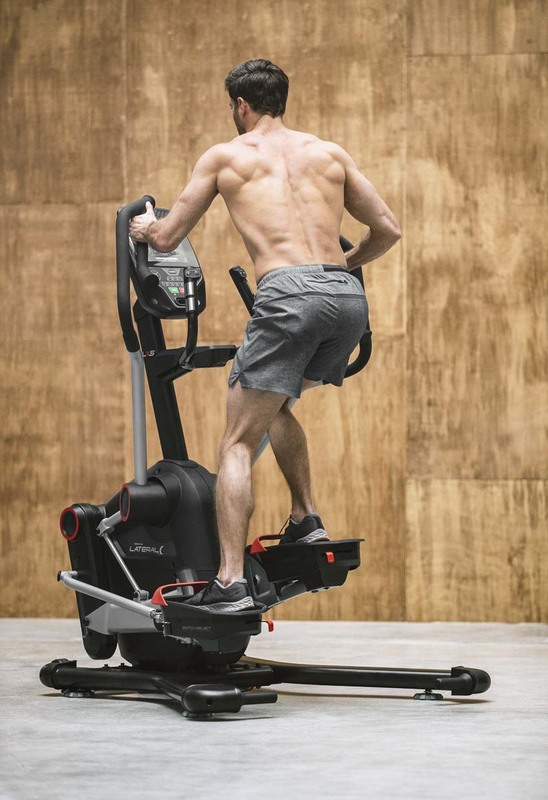 According to Quatrochi, Octane has its roots in low-impact products, which continues today with the brand’s ellipticals, exercise bikes, and the acclaimed Zero Runner, a machine that simulates running action without ground impact. The Schwinn Fitness brand gives users the freedom to have a little more fun with their workout. A brand line made up almost entirely of exercise bikes, Schwinn brings a classic household name into 21st century exercise technology. “Schwinn is really for the love of riding and being more active,” says Quatrochi. Bridging the gap between the commercial and home gym lines of products is the Nautilus brand, which focuses most heavily on cardio and strength training gym equipment. At the heart of it all is a company that is described by many as having one of the best workplace cultures in the area. With nearly 350 employees based at the company headquarters in Vancouver and over 500 employees nationwide, Nautilus, Inc. has undergone significant challenges in the past and come out even stronger than before. When the recession hit in 2008, Nautilus had approximately 1,300 employees. After losing over three quarters of its workers to the economic downturn, executives knew they were in a make-or break-position, and so began a company-wide restructuring campaign and 10 years of recovery that appears to have paid off. It was this same vision that led the team to develop the LateralX, which was released on July 26. While the jury is still out on the overall success of the product, Quatrochi says he remains hopeful. The Bowflex LateralX comes in two models, the LX3, priced at $1,999.00, and the LX5, with adjustable foot pedal width, priced at $2,699.00. For more information, visit www.bowflex.com/lateralx/.